Picture frames have always been a favorite way to share memories with family and friends. 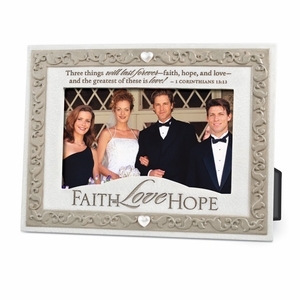 Brighten up your home decor with inspirational Christian picture frames that will be enjoyed for years to come. At LordsArt, we have a selection of all types of photo frames. We carry wood photo frames, wedding photo frames, baby picture photo frames,religious picture frames with scripture references, personalized Christian frames and many, many more. All frames are of high quality to display your loved ones’ photos with love and care. Whether you are purchasing for yourself, or as a gift to others, you will love these reminders of God's goodness and unfailing love. A picture frame is the perfect gift for those you care about most. It makes a great way to share your faith and anyone who receives it will treasure it for years and years to come.